Cherry Heering is a popular cherry-flavored liqueur. It is an essential ingredient for many classic cocktails, including the famous Singapore sling and the lesser-known, but equally impressive, blood and sand. This royal red liqueur is one of the best tasting cherry spirits on the market. It is often used in drink recipes that call for cherry brandy and is a good substitute for maraschino as well. 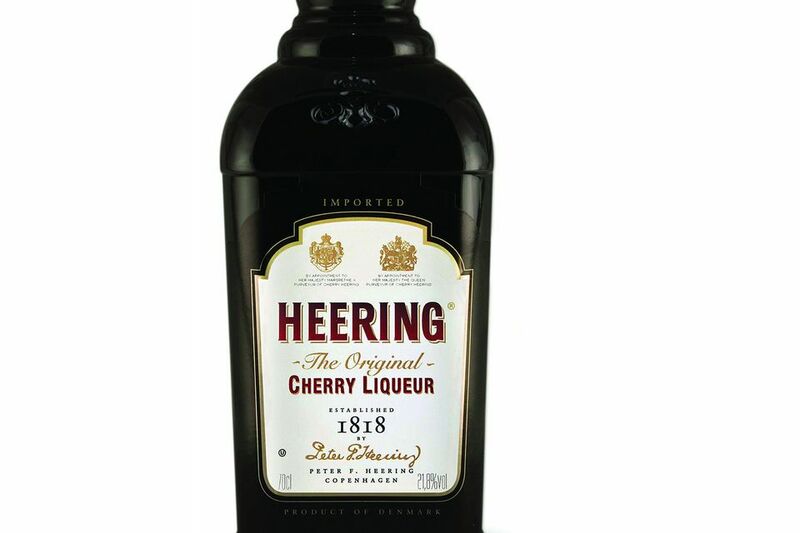 Cherry Heering was created by Peter F. Heering in 1818. Founded in Denmark, this liqueur quickly gained global recognition and was noted as a favorite among many of the world's royal courts of that century. It is still produced in Copenhagen and is bottled at 21.8 percent ABV (43.6 proof). This liqueur is unique among the modern offerings of cherry liqueurs. It is naturally flavored, made by lightly crushing Danish cherries and soaking those with a spice blend in neutral grain spirits. The mixture ages naturally in casks for five years during which sugar is added. It should be noted that the Heering website states that Cherry Heering contains nuts. Drinkers who are allergic to nuts would be best avoiding any drinks that contain the liqueur. Cherry is a tricky flavor when it comes to alcohol. Unless it is handled properly, the results can be (and often are) disastrous. If you have tasted any number of cherry-flavored distilled spirits you will know that they often take on a medicinal aspect. The liqueurs, brandies, and even infused vodkas and whiskies, often end up tasting more like cough syrup than cherries. Many of these failures come from artificial ingredients. It is in natural cherry spirits like Cherry Heering and quality maraschino liqueurs where the tiny fruits are handled properly that a good cherry liquor is produced. If you can enjoy it on its own without a flashback to your mother stuffing cough medicine down your throat as a kid, then you have a good cherry liqueur to work with. Cherry Heering is among the preferred cherry liqueurs for mixed drinks. Maraschino and kirsch are two other popular choices. Each has its own profile, and it's good to the differences so you can make a wise decision on which to pour into a particular cocktail. Cherry Heering is decidedly sweeter than the other two and has a deeper red color. It also has a very distinct cherry taste. Kirsch (or kirschwasser—German for "cherry water") is a common cherry brandy that is often clear in color and has a bitter cherry flavor. This is primarily due to the inclusion of pits in the production. It is has a drier profile than either of the other two. Maraschino is also clear and has a bitter aspect, though this is described as more of an almond flavor. There are more herbal notes in maraschino and the cherry flavor is very light. It is sweeter than kirsch, but not as sweet as Cherry Heering. For the most part, Cherry Heering can be used in cocktails that call for cherry liqueur, cherry brandy, kirsch, or maraschino. Some cocktails will specifically recommend one liqueur and it may be that its specific flavor profile is crucial to finding balance in the drink. Then again, substitutions can make equally impressive drinks. In cocktail recipes that call for cherry brandy, most people would choose either kirsch or Cherry Heering. You'll want to take note of the drink's overall sweetness to determine whether a drier (kirsch) or a sweeter (Cherry Heering) liqueur should be used. For those drinks that call for a generic cherry liqueur, the same thought process should be applied. Ask yourself, "What can the cherry liqueur bring to this drink and how do I want it to play against the other ingredients?" Since maraschino and kirsch are a little drier than Cherry Heering, consider a shorter pour of the recipe's other sweeteners when using it as a substitute. Keep in mind, too that you can always make adjustments to the recipe to suit your personal taste. For instance, the Jalisco high tea calls for Cherry Heering along with simple syrup. This can produce a tequila cocktail that's a little too sweet for some tastes and some drinkers may want more of a cherry flavor. In either case, replacing the syrup with more Cherry Heering would be an excellent option. Likewise, the lady liberty recipe is a rum cocktail that calls for maraschino. Since the drink is already pretty sweet, it may be best to cut back on the orgeat syrup if you were going to use Cherry Heering. Once you have a bottle of Cherry Heering in your bar, you'll begin to understand the many ways it can be used. It is definitely one of the best cherry liqueur options available today, so it's a purchase you are not likely to regret!